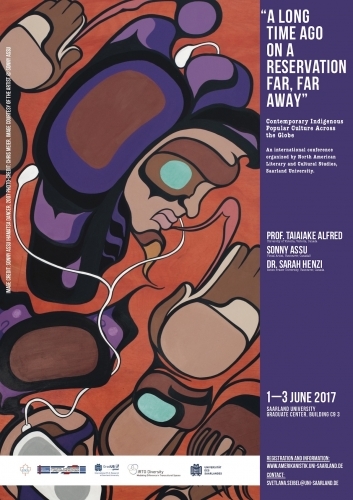 This three-day international conference is devoted to the field of Indigenous Popular Culture. It is organized by the IRTG Diversity's PhD Researcher and Associated PostDoc Svetlana Seibel and hosted by the department of North American Literary and Cultural Studies of Saarland University, Germany. Indigenous Popular Culture is arguably one of the most vibrant and fastest-growing fields of contemporary cultural production not only in the United States and Canada, but across the globe. Indigenous artists, writers, musicians, filmmakers, and entrepreneurs of all walks of life proliferate increasingly on the contemporary popular cultural landscape in all its various incarnations, from popular fiction to animation to the fashion world. While doing so, diverse Indigenous practitioners of the popular throughout the world not only intervene powerfully into the landscape of popular culture and representation - a cultural field which is notorious for its various appropriations and misrepresentations of Indigenous peoples - but also draw attention to the pressing social issues which Indigenous communities of today are faced with. Thus, Indigenous popular culture is not only a field of a dynamic creative expression, but often also in one way or another stands in dialogue with contemporary Indigenous activist groups and causes working towards the goal of decolonization and resurgence. "CONFERENCE PROGRAM Indigenous Popular Culture"